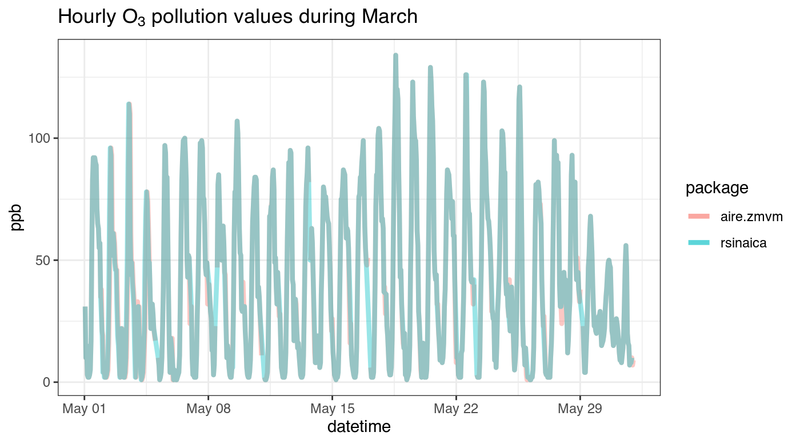 The hourly data from the aire.zmvm package in most cases corresponds to the GMT+6 time zone (with no Daylight Saving Time), while according to the stations_sinaica data.frame the data for the Xalostoc station comes in the local Mexico City time that includes Daylight Saving Time during the summer. Be warned that each station submits its data to SINAICA according to their chosen time zone, and sometimes the reported time zone may be incorrect. Then we download the data and make sure that both the values from aire.zmvm and rsinaica are in ppb (parts per billion), since rsinaica returns values in ppm (parts per million) we multiply by 1,000. We can visually compare them with a plot. The values are extremely similar, but the aire.zmvm data is a little bit more accurate since it comes directly from the source.